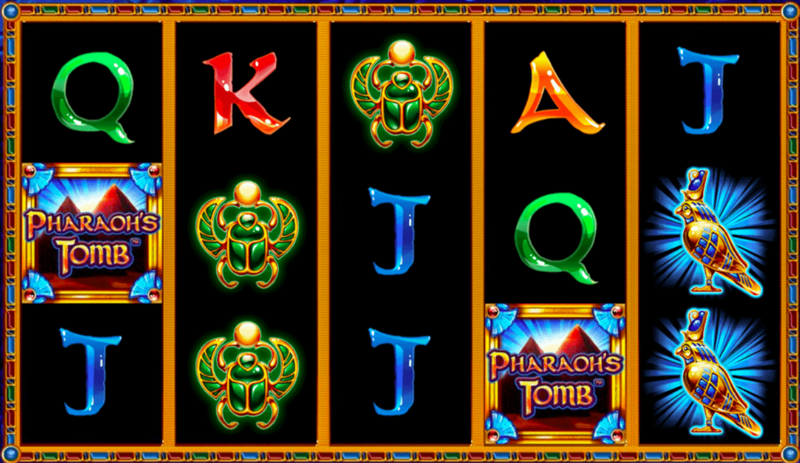 Play Pharaoh’s Tomb™ at Slotpark now directly in your browser! This special slot from Novomatic set a new benchmark in innovative game mechanics when it was released. In this slot adventure you can follow in the footsteps of the ancient Egyptians on a mission to plunder the treasure chambers of the once mighty ruler. 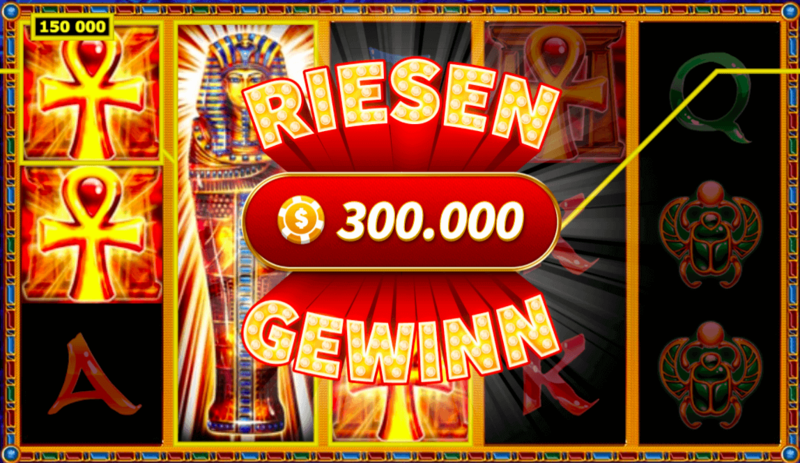 Hieroglyphics, stunning jewellery and magnificent talismans will help you fill your gaming account to bursting point! The Mask is the Wild symbol in Pharaoh’s Tomb™. As a result, it can substitute for every other symbol in the regular game to form a winning combo along an active win line. 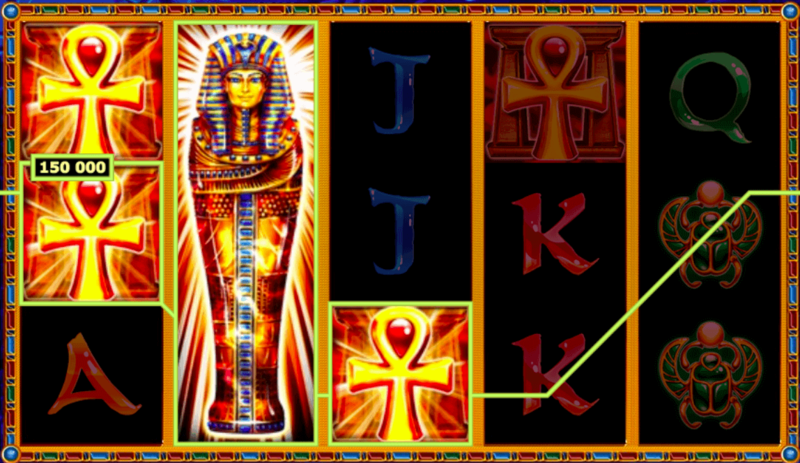 The Pharaoh’s Tomb™ logo is this slot’s Scatter symbol. Get five symbols along a win line and you’ll bag not only the highest possible round win, but also twelve Free Games. 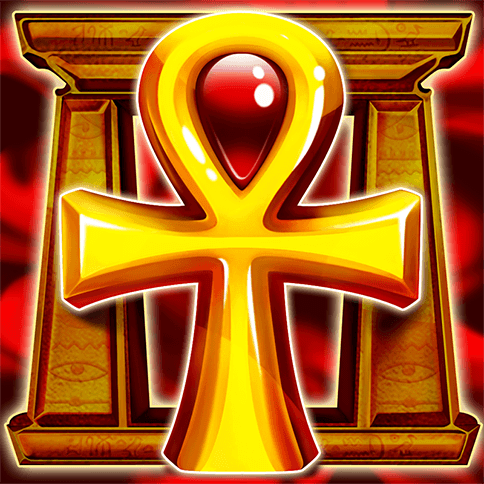 Recover antique treasures with Pharaoh’s Tomb™! This Novomatic title once paved the way for a host of entertaining game mechanic features to become standard in the world of Vegas slots. With ten win lines and five reels to play with, you can use the nine groups of winning symbols to get the most out of every round. You are free to choose your stake and the number of active lines. But what makes Pharaoh’s Tomb™ so very special from the very off is the chance to win Free Games while playing Free Games. All you need is a single Wild symbol that covers an entire reel to bump every winning combo of matching symbols up a level and boost the potential winnings. Reels covered by a symbol like this trigger up to five additional Free Games. And it’s a process that can repeat itself several times! In Pharaoh’s Tomb™, the Wild symbol performs a unique extra role during the regular game rounds. Every combination of winning symbols that could yield a win along an active win line is supported by the Wild. Not only can it substitute for a missing symbol, but it can also increase the combo’s value. 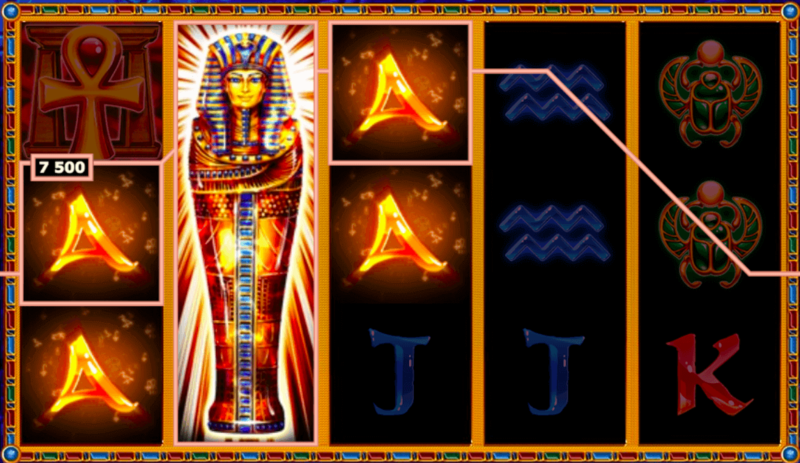 For example: The first group of hieroglyphs in this slot is made up by the orange Sails. Get five of them and you’ll win 20 times your stake. However, if you need the help of a Wild symbol to complete the combo, the whole combination counts as if it were made up of blue Wave symbols. The next group comprises the Snake and Scarab symbols. Five Snakes win you a x25 multiplier, and although the emerald-encrusted Scarab is rarer, it delivers a slightly higher multiplier. The iridescent blue Bird is also rarely spotted on the reels, but it promises a x40 multiplier. The golden Ankh and the Scatter have the same multiplier in Pharaoh’s Tomb™. Get five of them along a win line and you’ll instantly win 50 times your stake… or maybe even more should you be brave enough to stake your winnings again! What would Novomatic’s slots be without their tried and tested gamble feature? With 50:50 odds, you have the opportunity to double every win. Simply click on the gamble button and a deck of cards will be shuffled and placed in front of you. Some of the cards will then be laid out, and your task will be to correctly predict what colour the next card in the deck is. But be aware: If you guess incorrectly, your winnings from that round will be lost. 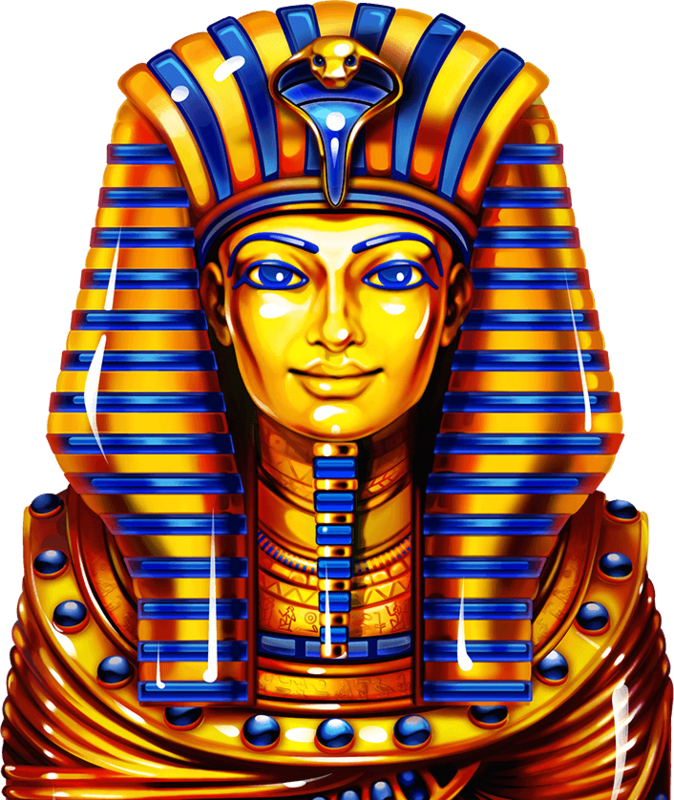 In Pharaoh’s Tomb™ we can now offer you a true classic in our Social Casino. We’re delighted and proud to make this hit slot available to you directly in your browser. The wonderful winning symbols, awesome sound effects and generous Free Games are just a few of the many reasons why Pharaoh’s Tomb™ is worthy of this honour. And we’re certain that you’ll be entertained for hours, not least thanks to the game’s return to player rate of over 95%! But don’t just take our word for it, try it out and see for yourself – completely free of charge at Slotpark!